(JTA) -- Israel's U.S. ambassador, Michael Oren, outlined for Jewish leaders his country's list of priorities in framing peace talks with the Palestinians. Oren, speaking Thursday in a conference call, said Israel was ready to accept President Obama's outline on May 19 of renewed talks, based on the 1967 lines with mutually agreed land swaps, as long as it was framed by what he called the "terms of reference": the recognition of Israel as a Jewish state; no return of Palestinian refugees; and a long-term military presence for Israel along the Jordan-West Bank border. Also, that an agreement would end all claims. He offered the terms after describing the recent intensive shuttle diplomacy aimed at restarting direct talks, with negotiators and U.S. facilitators traveling back and forth in recent weeks between Washington, Jerusalem and Ramallah. During the call organized by the Conference of Presidents of Major American Jewish Organizations, Oren insisted that the terms were not preconditions; Israel has pushed back Palestinian demands for a settlement freeze as an unwarranted precondition. Pressed by a questioner, however, Oren acknowledged that Israel's demand that the Palestinian Authority end reconciliation talks with Hamas was a precondition. Obama has called for an end to all claims, recognition of Israel as Jewish and for a finite Israeli presence in the Jordan Valley, and a non-militarized Palestinian state. The issues of refugees and Jerusalem should be deferred until later, the president has said. The Palestinians have accepted Obama's proposal in principle. Prime Minister Benjamin Netanyahu praised the United States as a champion of freedom and a great ally of Israel in his address to the annual Fourth of July celebration at the U.S. ambassador's residence in Tel Aviv Thursday night. Netanyahu recounted the history of the American Revolution 235 years ago, saying that many of the ideas that fueled the U.S. struggle for independence are applicable to nationalist aspirations today, particularly in the Middle East. The prime minister lauded the United States for its unwavering commitment to freedom, saying “never in history has there ever been a nation so concerned with the freedom” of people throughout the world. He added that few nations appreciate this commitment more than Israel. Netanyahu emphasized the importance of U.S.-Israel ties, saying that since its inception 63-years-ago, the United States has been an unrivaled ally and invaluable source of support. “For decades, America has stood by Israel’s side,” he said, adding that Israel owes much of its success in defeating its attackers to American assistance. Netanyahu credited the U.S. with moral, diplomatic and military support for Israel, praising the Obama administration for its insistence on the importance of reaching a negotiated settlement with Israel’s neighbors. The prime minister thanked the U.S. for providing Israel with the means to deploy the Iron Dome missile defense system in the south, which has successfully intercepted missiles launched from the Gaza Strip at civilians. Netanyahu said that Israel never had, nor would it ever have, a better partner than the U.S. “May the power of the U.S. prosper forever, and may the friendly ties between us continue to deepen,”Netanyahu said. (Lilach Weissman-Globes).The fear in the prime minister's bureau at the prospect that Yair Lapid and Aryeh Deri might stand in the next elections is apparently justified. If television presenter Lapid, son of the late Shinui party leader Yosef Lapid, and/or former Shas leader Deri decide to make a move into politics, the structure of right-wing and left-wing blocks in Israel will become much more fluid. According to a poll by Rafi Smith for "Globes", if elections were held today with the existing party structure, Likud would strengthen to 29 Knesset seats, and the right-wing block would have 69 seats, taking Prime Minister Benjamin Netanyahu to another term. However, if Deri and Lapid each decide to stand at the head of an independent party, Likud will lose seven seats and shrink to 22, and the right-wing block will fall to 56 seats. If that happened, Netanyahu would not be able to form a right-wing coalition, or indeed any coalition at all. The entry of the two new players would hit everyone. Kadima would lose seven seats and fall to 20; Shas would lose four seats, cutting it to six; while Labor would also lose two seats to Lapid and fall to seven. In this scenario, Kadima is weakened, shrinking by nearly a quarter, but its chances of forming the next coalition actually rise, If Kadima, with 20 seats, teams up with Lapid (projected to win 16 seats), Deri (projected to win eight seats) and Labor (seven seats), and brings in Meretz (three seats) as well, it can block Netanyahu, which could make Tzipi Livni prime minister, or lead to a national unity government with rotation for the premiership. The two new players can help Livni block Netanyahu, but will not win enough seats to form a coalition. Things could turn dramatic though if Minister of Foreign Affairs Avigdor Liberman decides to outflank Netanyahu and take his Yisrael Beiteinu party to join Livni's block. President Shimon Peres spoke Thursday at the graduation ceremony of the Israel Air Force pilots' training program, and said that Iran is exaggerating its military ability, but Israel is well aware of the dangers it faces. "Iran has been publicly exaggerating its military capabilities , but Israel is not a gullible country and is aware of the dangers posed against it"
"I suggest Iran doesn’t underestimate Israel's capabilities, even if it does not make them public… Iran's captains publically threaten Israel's existence and invest a fortune in a terrorist military array. But we will know how to deal with the Iranian danger without forfeiting the desire for peace....I wish them a future free of tyrants and hatred". "Israel faces many challenges. There are constant attempts to undermine our borders and our very existence. The IDF and other security forces rise to the challenge and develop our defense abilities, reaching the highest we've ever known before." "Overall, Israel is steadily growing stronger. We are ready for any challenge. Out ability to defend ourselves is the foundation of our existence and a foundation of the future peace with our neighbors." "Israel has the right to act against attempts to enable missile, rocket and arms smuggling into the Hamas terror enclave. "I wish to thank the many world leaders who expressed themselves and acted against this provocation flotilla, including the US, Europe, the UN secretary general and the prime minister of Greece. Hamas is a cruel enemy who maliciously harms our people and children and holds Gilad Shalit captive against all humane standards". "We are facing serious challenges, such as Iran, Hezbollah and other radical elements. We are at the heart of a hostile environment, where the language of power and force is the only one understood". "Israel is strong and deterrent and it is from this position of power that Israel seeks peace. It is our duty as leaders to exhaust every possibility to reignite the peace talks with our neighbors, while maintaining Israel's security interests. But that takes a partner." Vice Premier Ya'alon: The situation in the Middle East region "is sustainable"
Moshe Ya’alon, Israel’s Vice Prime Minister and Minister of Strategic Affairs, met and addressed on Wednesday the delegation of Jewish parliamentarians during their visit to Israel. He expressed hope that the economic sanctions against Iran also intensify, as they are “a very effective tool in a dilemma [of having to choose between] a nuclear bomb or survivability. Ya’alon also addressed the Palestinian Authority’s plan to seek recognition of a state at the UN General Assembly, and said this idea will not serve the interests of Israel, the PA, and even the United States. POLITICO's Ben Smith reports on President Barack Obama's potential slide in support among Jewish supporters. Many pro-Israel Democrats are reprising doubts about Obama first raised in 2008. This could, on the margins, cost the president votes and money in 2012 - political damage that would not be easy to repair. David Ainsman really began to get worried about President Barack Obama’s standing with his fellow Jewish Democrats when a recent dinner with his wife and two other couples — all Obama voters in 2008 — nearly turned into a screaming match. Ainsman, a prominent Democratic lawyer and Pittsburgh Jewish community leader, was trying to explain that Obama had just been offering Israel a bit of “tough love” in his May 19 speech on the Arab Spring. His friends disagreed — to say the least. One said he had the sense that Obama “took the opportunity to throw Israel under the bus.” Another, who swore he wasn’t getting his information from the mutually despised Fox News, admitted he’d lost faith in the president. Most of those interviewed were center-left American Jews and Obama supporters — largely die-hard Democrats, and many of them Democratic donors. On some core issues involving Israel, they’re well to the left of Netanyahu and many Americans: They refer to the “West Bank,” not to “Judea and Samaria,” fervently supported the Oslo peace process and Israel’s unilateral withdrawal from Gaza and believe in the urgency of creating a Palestinian state. But they are also fearful for Israel at a moment of turmoil in a hostile region when the moderate Palestinian Authority is joining forces with the militantly anti-Israel Hamas. “It’s a hot time, because Israel is isolated in the world and, in particular, with the Obama administration putting pressure on Israel,” said Rabbi Neil Cooper, leader of Temple Beth Hillel-Beth El in Philadelphia’s Main Line suburbs, who recently lectured his large, politically connected congregation on avoiding turning Israel into a partisan issue. Scott Matasar, a Cleveland lawyer who’s active in Jewish organizations, says he’s appalled by Obama’s “rookie mistakes and bumbling” and the reported marginalization of a veteran peace negotiator, Dennis Ross, in favor of aides who back a tougher line on Netanyahu. He’s the most pro-Obama member of his social circle but is finding the president harder to defend. Philadelphia Jewish Democrats are among the hosts of another top-dollar event June 30. David Cohen, a Comcast executive and former top aide to former Gov. Ed Rendell, said questions about Obama’s position on Israel have been a regular, if not dominant, feature of his attempts to recruit donors. “I takes me about five minutes of talking through the president’s position and the president’s speech, and the uniform reaction has been, ‘I guess you’re right, that’s not how I saw it covered,’” he said. Even Democratic National Committee Chairwoman Debbie Wasserman Schultz, who spoke to POLITICO to combat the story line of Jewish defections, said she’d detected a level of anxiety in a recent visit to a senior center in her South Florida district. “There’s an inclination in the community to not trust this president’s gut feel on Israel and every time he sets out on a path that’s troubling you do get this ‘ouch’ reaction from the Jewish Community because they’re distrustful of him,” said the president of a major national Jewish organization, who declined to be quoted by name to avoid endangering his ties to the White House. Read the Arena's debate with policy makers and opinion shapers. When it goes personal, the situation and the governments policies suddenly becomes a worrying factor for Israel's Future... it happened with Former Mossad Chief Meir Dagan, after his role as Mossad head was not extended, and it turns out that Ronald Lauder, that criticized Obama's Middle East speech, is criticizing Now Netanyahu's widely supported vision, why? is anybodys guess. "@BarakRavid: @Bibireport My impression is that the Lauder-BB feud is mainly personal. Obama and the peace process are just an excuse"
(Barak Ravid-Haaretz). World Jewish Congress President Ronald Lauder, who in the past was considered one of Benjamin Netanyahu's biggest donors and supporters, lashed out at the prime minister's diplomatic policy Monday night. Addressing the International Council of Jewish Parliamentarians at a conference that was closed to journalists, Lauder said Israel must present a diplomatic plan in order to regain international support and block Palestinian efforts to obtain unilateral recognition for statehood from the UN in September. It could be that such an initiative would amount to committing political suicide for Netanyahu, but it would send the ball back into the Palestinian court, he said, according to a Hebrew translation of his remarks released afterward by a conference spokesman. Lauder also criticized the conditions Netanyahu has set for talks, saying the only way Israel can escape its international isolation is to agree to begin negotiations without preconditions. The international community couldn't care less about Netanyahu's domestic political problems, he said. Lauder's remarks are significant mainly because he has long been one of the international Jewish leaders considered closest to Netanyahu, and because he is thought to have relatively conservative views on the Palestinian issue. During Netanyahu's first term as premier in the 1990s, Lauder even served as his secret envoy to then-Syrian President Hafez Assad. His criticism is also noteworthy because Lauder is known as a fierce critic of U.S. President Barack Obama's Middle East policies. Less than six weeks ago, the WJC president issued a statment blasting Obama's Middle East policy address on May 19, saying Obama's call for negotiations to take place on the basis of the 1967 lines (with territorial swaps ) endangered Israel. Since Netanyahu took office two years ago, Lauder has sent letters to Obama and Secretary of State Hillary Clinton urging the administration to stop pressuring Israel over the settlement issue. He also took out several huge newspaper advertisements in which he attacked Obama and defended Netanyahu; he later said he obtained Netanyahu's approval before publishing these ads. In recent weeks, however, their relationship has been tense. Netanyahu did not attend last week's annual meeting of the WJC in Jerusalem, as he has in previous years, canceling at the last minute. Daily newspaper Maariv reported last week that Netanyahu canceled his appearance because he was furious that Lauder - a major shareholder in the Channel 10 television station - did not prevent the broadcast of a series of investigative reports about overseas trips of Netanyahu's that were financed by private individuals or organizations. Netanyahu and his wife, Sara, apparently viewed this as a personal insult, and the cancellation was meant to signal his displeasure. (Jpost).Strategic Affairs Minister Moshe Ya'alon said reports from army sources that participants in the flotilla to Gaza plan on attacking IDF soldiers with lethal force are accurate, according to an interview Wednesday with Israel Radio. Ya'alon said that he is convinced that participants are planning to attack IDF soldiers that will try to stop the boats, no doubt the evidence was reliable. "We received the information in the last few days, and according to this intel there are elements that will be violent. The IDF should be aware of this possibility." "Before the last flotilla they presented themselves as pensioners and innocents, but our forces encountered fundamentalist Muslim extremists." "There is no crisis in Gaza, their economy is flourishing and this month alone two new hotels are scheduled to be opened, with a shopping center set to open next week. The markets are full and no one is dying of thirst or hunger." (Shlomo Cesana-IsraelHayom).Israel's Public Diplomacy Corps is also preparing for the upcoming flotilla. An exercise was conducted Tuesday to see how the corps would respond to a scenario in which 500 activists aboard 10 ships entered Israel's territorial waters. Public diplomacy officials from the Prime Minister's Office, Foreign Ministry, Public Diplomacy Ministry, IDF Spokesperson's Unit, Government Press Office, Jewish Agency and other organizations took part in the simulation. The diplomats were asked to respond to a scenario in which the IDF approached the ships and was then attacked with stun grenades and even a live grenade, causing several injuries to our troops. The IDF took control of the ship, neutralized the attackers, who had used both lethal and non-lethal weapons. Ten IDF soldiers were injured, two flotilla activists killed, and another 14 injured. The public diplomacy corps practiced how to respond to the ensuing flood of media disinformation, with special attention to misleading reports on Facebook and Twitter, some of which were disseminated by private individuals and others by Hamas. During the simulation, the situation room, working in coordination with national public diplomacy staff and the IDF Spokesperson Unit, started releasing reliable reports to Jewish communities and pro-Israel groups around the world. In addition, situation room staffers responsible for new media started updating their posts to social networks. "In the face of the flotilla provocation, whose sole purpose is to damage Israel's global image, we have set up a special situation room to ensure cooperation between the Israeli government and Jewish communities and Israel advocates around the world," Public Diplomacy and Diaspora Minister Yuli Edelstein remarked upon completion of the exercise. "We are here to unmask the true face of the terror organizations and hate-filled provocateurs organizing the flotillas to Gaza, and to distribute pictures and information in real-time over the Internet. I am confident that we will be reinforced by tens of thousands of activists from Jewish communities all over the world". PM Netanyahu's Addressed today the Jewish Agency Board of Governors in Jerusalem, PM Netanyahu repeated his outlined principles that can serve as a basic framework for a viable and lasting peace between Israel and the Palestinians, the Real Two State solution,a vision backed by a majority of Israel, the most moderate, realistic peace plan. Netnayahu started by pointing out that "The overwhelming majority of Jews in Israel and outside Israel, Israelis in Israel and friends of Israel outside Israel, agree on the basic framework of peace assuming we had a peace partner who wanted to make peace with Israel. I outlined this basic consensus in my recent speeches in the Knesset and in my speech before the American Congress. And I know that I expressed a vision of peace that is in these speeches that is supported by the overwhelming majority of Israelis". "The first is that we seek to achieve a peace and mutual recognition between two states, two nation-states for two peoples: a Jewish State which means a nation-state, the nation-state of the Jewish people, Israel, and a nation-state for the Palestinians. This conflict is about the Jewish State. It’s about the persistent refusal to accept that the Jews have a right for a nation-state of their own and anybody’s. It precedes the question of boundaries; it precedes the question of territorial dispute; it is a dispute against our very right to exist as a sovereign Jewish State. It has always been that. It’s just been masked but it explains why this conflict extended itself for half a century – from 1920 till 1967 when there were no “territories”; no Israeli soldiers in Judea, Samaria or Gaza; no refugees for half that time; and Jerusalem was divided. Half of it was in Arab hands, but there was for fifty years this horrible conflict. What was it about? It was about our existence as a Jewish State; a refusal to accept this idea of Zionism before the establishment of the State and a refusal to accept the idea of a Jewish State after it’s existed. And that has not disappeared. "I stood before my people, people of Israel and I said numerous times that I will accept a Palestinian state. Now President Abbas must stand before his people and he has to say these six word, “I will accept the Jewish State”. He has to say it. And I will repeat this over and over and over again because it is the attempt to fudge, it’s the attempt to fudge and evade and obscure this essential component of peace; the removal of this basic obstacle to peace that is required and this is what the international community must face up to....once they say it, we will move inexorably towards peace. The second point is that the refugee problems are settled in these two respective states – the question of Palestinian refugees will be resolved in the Palestinian state and not in Israel. Just as the question of Jewish refugees caused by that same Arab assault on Israel in 1948, was resolved within the Jewish state. The Arab attack, the attack of five Arab armies, with the Palestinians, on the embryonic Jewish state caused two refugee problems. About 650,000 Palestinian refugees and a somewhat larger number of Jewish refugees expelled from Arab states. Tiny Israel absorbed all the Jewish refugees and the vast Arab world refused to absorb the Palestinian refugees, and neither justice nor common sense mandates that 63 years later, the Arab world or the Palestinians will come to us and say: Now, absorb the great-great-grandchildren of this part of the refugee problem that we created ourselves. The third point is the demilitarization of the Palestinian state. We don’t want a repeat of what happened when we withdrew from Gaza or from South Lebanon. I believe that this will require for Israel to maintain a long-term military presence along the Jordan River. A peace you cannot defend will not hold. A peace you can defend will. The fourth point is to incorporate what are called the settlement blocs, these large, urban communities that are fairly dense and concentrated alongside Greater Tel Aviv and Greater Jerusalem, and other areas of critical, strategic and national importance in the final borders of Israel. We believe also that Jerusalem must remain united, under Israeli sovereignty. And the last is the ending of the conflict, the ending of the claims. By that I mean that if we shall make an agreement based on these principles, and these are not preconditions to entering negotiations, these are the foundations of achieving a durable peace if we can exit the negotiations, once we enter and finish the process. But the main point is that what we have to achieve is an end to conflict. Not to create a Palestinian state alongside the State of Israel to continue the conflict and try to dissolve Israel by flooding it with refugees or by inducing irredentist pressures on the Arabs of the Galilee or the Negev, or the idea of a binational state – but actually end the conflict, accept the Jewish state and alongside it a Palestinian state so that we may have peace for ourselves and our children and our grandchildren and for future generations, and not a continuation...."
Prime Minister Netanyahu on Tuesday called on Palestinian Authority President Mahmoud Abbas to recognize Israel as a Jewish state, saying: "Just say the six words – 'I will accept the Jewish state." This conflict is about the Jewish State. It’s about the persistent refusal to accept that the Jews have a right for a nation-state of their own and anybody’s. It precedes the question of boundaries; it precedes the question of territorial dispute; it is a dispute against our very right to exist as a sovereign Jewish State. It has always been that. It’s just been masked but it explains why this conflict extended itself for half a century – from 1920 till 1967 when there were no “territories”; no Israeli soldiers in Judea, Samaria or Gaza; no refugees for half that time; and Jerusalem was divided. Half of it was in Arab hands, but there was for fifty years this horrible conflict. What was it about? It was about our existence as a Jewish State; a refusal to accept this idea of Zionism before the establishment of the State and a refusal to accept the idea of a Jewish State after it’s existed. And that has not disappeared. "I stood before my people, people of Israel and I said numerous times that I will accept a Palestinian state. Now President Abbas must stand before his people and he has to say these six word, 'I will accept the Jewish State'." "I will repeat this over and over and over again because it is the attempt to fudge, it’s the attempt to fudge and evade and obscure this essential component of peace; the removal of this basic obstacle to peace that is required and this is what the international community must face up to, once [the Palestinian leadership] says it, we will move inexorably towards peace." Robert Wexler lashes out on Netanyahu: "You can not behave like that in your host's living room. An American political man, a familiar name, a Democrat that served a few terms in Congress (Robert Wexler, that participated this week the president's conference in Jerusalem), and is considered to be a personal friend and very close to President Barack Obama, He is also involved in preparing the strategy for the Obama campaign in 2012. This week, on condition that his identity would not be revealed, he spoke in a private conversation on the relationship between Obama and Benjamin Netanyahu, following the journey and the last heroic victory of Netanyahu in Washington. From the Status of the things he says, is it actually almost as if Obama himself said it: "Prime Minister Netanyahu was looting the President. He came to Washington to enter a confrontation with Obama, and did it in a humiliating and degrading way. It began on the plane, when Netanyahu took the uproar on President Obama's speech. The problem was that he had twisted the words of the President, and distorting them on purpose. "It was just a false impression, becuase Bibi knows very well what Obama meant when he spoke about 67 lines border with adjustments. Netanyahu knows the territorial exchange intent excellent, But he did not mind a deliberate confrontation with the president, Then the meeting between them on Friday, when Netanyahu gave The "Lecture" to Obama's face and the microphones in the Oval Office, was already the peak. "You not only guest at the White House, Mr. Netanyahu, you are the leader of a close ally of America. You can not behave like that in your host's living room. It was not just an insult, it was a display of disrespect, bad manners, not only against the President himself as a person, but also to the entire presidential institution. I do not remember such behavior in the history of relations between the countries." "Netanyahu left behind him in Washington scorched earth. Currently, the president and his people speak about him in disgust. At this stage, this does not hurt the overall framework of relations between the two countries and the American commitment to Israel's security. Ironically, Obama went right after his traumatic meeting with Bibi to Europe, where he immediately approached the task of persuading the Europeans to cooperate with the course of September of the Palestinians. "Then he managed to sabotage and bury the French initiative to convene a peace conference, Obama proves he transcends his feelings against Bibi, and continues to fulfill his obligations as president of the most important ally of Israel. He separates the sense of responsibility. Despite the patronizing behavior and Netanyahu's audacious for him. Bibi thinks he won, he does not realize he had lost, lost a close relationships, which is a kind of ingratitude. True, the relationship between Israel and the United States rises above these occasions, but the damage is heavy. Between the two sides there are currently no stock of goodwill for emergencies, the credit is over. There is no trust between Israeli Prime Minister President of the United States, The State Department and the Pentagon feel that way too, The Goodwill facilities were just sold out ". That’s had a big impact on the conflict, although not the outcome Obama foresaw. Abrams points out that Obama’s policy has been obviously ineffective, measured by the fact that there have been no negotiations at all between Israelis and Palestinians, which he blames on Obama’s insistence on settlement freezes and 1967 lines as preconditions. But another development, the Fatah re-alliance with Hamas, threatens to keep talks derailed. (To my question as put up on Twitter: if Bush would regret now, having permitted hamas participate in the Gaza Elections, in the name of Democracy?) Abrams thinks that the US acquiescence to Hamas’ participation in Gaza elections was “a mistake of principle.” At the time, keeping Hamas out was seen as a delegitimizing move for the elections, and the US insisted that Hamas end its terrorism if they won the elections. Now Abrams says that the US position should have been — and should remain — that terrorist organization should be barred from elections entirely". (Ma’an) -- Prime Minister Benjamin Netanyahu has reportedly agreed to peace talks based on 1967 borders on the condition that the Palestinians recognize Israel as a Jewish state and solve the Palestinian refugee issue outside of Israel's borders, Israeli daily Maariv reported today. Netanyahu announced the position to US presidential Middle East adviser Dennis Ross, and acting envoy for the Middle East David Hale, both of whom Netanyahu met with last week. Netanyahu also reportedly issued his stance to EU foreign affairs chief Catherine Ashton and special envoy for the Middle East Quartet Tony Blair, in meetings held this week, the Israeli daily stated. Netanyahu told Israel's third annual Presidential Conference, that the two sides would not be able to resolve their conflict until the Palestinians accept the existence of a Jewish state as the homeland of the Jewish people. "President Abbas must do what i did 2 years ago, face the Palestinians and say: I will accept the Jewish State". "Peace begins with six simple words: I will accept the Jewish state, That's what will change history." Referring to frequent Palestinian comments that Israel can “call itself whatever it wants,” Netanyahu stressed that the issue was not over what it calls itself, but rather over what it is. "It's easier than a Nike commercial, they say: 'Just Do it', I say: 'Just Say it', accept the Jewish State of Israel, and lets make peace once and for all". 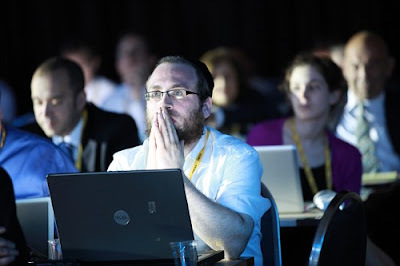 (Ed Morrissey-HotAir.com).The second day of the Israeli Presidential Conference has concluded, with plenty of interesting debate on policy. In bouncing from session to session, I caught bits and pieces of arguments, some of which caught my ear, especially when Lawrence Summers started defending Barack Obama on economics, he and other speakers seem to be going out of their way to express support for the American President. There was still plenty of fascinating discussion, primarily for me in the opening plenary session. Retired General Amos Yadlin, former head of IDF intelligence, spoke at length about the external challenges facing Israel. While calling himself an optimist, Yadlin had plenty of less-than-rosy observations to share with the audience, including a passage near the beginning that evoked Donald Rumsfeld. He called the unforeseen Israel’s greatest challenge; as no one could have predicted the emergence of cyberspace 25 years ago (in which Yadlin insists the Israelis can compete effectively), it’s the unknown unknowns that worry Yadlin most. Yadlin framed the future as a challenge of competitions between Iran’s pursuit of nuclear weapons and the anticipated democratization of the Arab nations. Niall Ferguson threw some cold water on the latter point later in the session, but Yadlin was more optimistic. At the very least, Yadlin believes that the Arabs are being forced to look inward for the source of their miseries instead of having Israel as a scapegoat, which Yadlin predicts will be a “transformative event” in the region. Tzipi Livni then addressed the conference, She spoke forcefully for the need for direct negotiations, saying “every moment of delay is a moment wasted.” The two-state solution, Livni said, was the only way to preserve the nature of the Jewish state thanks to the demography of Israelis and Palestinians — a point that my friend Carl in Jerusalem (whom I met later in the day) disputes. Livni accused the current government of weakness in its indecision and called for Israelis to unite around a single plan, and a new vision for Zionism. Later in the day, I got an opportunity to talk at length with former Consul General to New York Alon Pinkas, also a frequent contributor to Fox News, the Jerusalem Post, and a regular in Politico’s “The Arena” feature. Pinkas was a very gracious interview subject, as you can see from the length of the interview, which goes for almost 30 minutes. We did about ten minutes of off-line prep for the interview and another five or so afterward. Pinkas has few illusions about Palestinian leadership, and he agreed when I suggested that a Fatah-Hamas alliance puts Israel back at square one. Still, Pinkas says he’s more concerned about Israel than the Palestinians, which is why he believes that Israel needs to press for negotiations. “The lousiness of this neighborhood is not going to go away any time soon,” Pinkas says, but that’s why Israel can’t wait for long to do what it can to end the standoff. Doing nothing and demanding better partners for peace won’t work, even if the Palestinians don’t provide a real partner for peace at the moment. TOMORROW11 BLOG - Obama and Israel - Where's the love y'all? (Via jpost).A high-profile panel discussing the state of Israeli-US ties at the Israeli Presidential Conference in Jerusalem, a discussion that was essentially boiled down to one question: does Obama, in his kishkas, love Israel. "There is no great love in his heart for Israel, Despite the 'propaganda' being disseminated by the White House, Obama does not share the same sympathetic view toward Israel as did Bush or even Bill Clinton". Abrams said that while the Republican candidates in 2012 can be expected to compete with themselves over who will articulate more support for Israel, by contrast the Democratic party -- according to what he said was poll data and votes in Congress-- is “no longer as solid a base of support for Israel." Abrams contrasted positively, however, Israel's overall standing in the US with its position in Europe, saying that while the campaign to delegitimize Israel is having headway on the Continent, it is not making an impact in the US. "I don't know what love Obama had in his heart for Israel or what love he had on any topic, and for that matter i didn't know the level of love Clinton or Bush had in their heart for Israel either". "I can only judge statements, deeds, and actions". "That is a lot of love, The notion that Obama does not have the requisite love, or cares in his kishkas, defies the facts". Former IDF spokesman Ruth Yaron countered that even with all that, Israelis want to feel the love, not just hear that the President has done a great deal for security cooperation. "I'm not questioning his love, I would say please make sure this love is not only felt, but also seen by countries around us. Without feeling secure in this love and a feeling that Israel will never be left to walk alone, the country would be less willing to take risks". "Obama is not a 'warm and cuddly guy'. He is a no drama Obama, it’s time to grow up. We should get over the question of whether he loves me or he loves me not, and focus on question of finding a solution to conflict with the Palestinians. When Israel decides by itself to solve that problem, it will have the overwhelmingly cuddly support of the US President." (Aluf Benn-Haaretz). You may love or hate Prime Minister Benjamin Netanyahu, but there is no arguing with his success. Since he returned to power, Israel has enjoyed security calm, economic growth and political stability of a sort not seen for the last generation. The people prefer Netanyahu's diplomatic standstill and security restraint to the policy of his predecessor, Ehud Olmert, which combined diplomatic daring with military adventurism. Israelis are in love with the status quo and do not want to be disturbed by peace initiatives or wars. Netanyahu's passivity suits them just fine. In foreign policy, Netanyahu has proven to be a successful diplomat who knows how to leverage crises and turn them into opportunities. He took advantage of U.S. President Barack Obama's political difficulties to end the freeze on settlement construction and fend off an American peace initiative. His assessment that he would be able to pressure the president with the help of Congress and the American Jewish community proved right. Obama is fighting to be reelected to a second term, and is thus scattering declarations of love for Israel even though he cannot stand Netanyahu and his policies. When Turkey confronted Israel over the flotilla crisis, Netanyahu was quick to form a strategic alliance with Greece. When relations between Ankara and Damascus became rocky and Greece found itself on the verge of financial collapse, Netanyahu moved closer to Turkish Prime Minister Recep Tayyip Erdogan again. He used the reconciliation agreement between Fatah and Hamas to shake off international pressure for concessions to the Palestinians, thereby preserving his freedom of action. Now, he is fighting Palestinian Authority President Mahmoud Abbas' initiative to gain UN recognition for a Palestinian state. The General Assembly session in September is still far off, but Abbas is showing signs of weakness, and his determination to follow through with his plan appears to be faltering. The revolutions in the Arab world only bolstered Israel's strategic position. The United States and its European partners have lost their allies in the region. The Arab regimes are falling apart or fighting for survival, and Israel has been left as the sole island of stability and unreserved support for the West. Iran is continuing its nuclear program, but it is torn by domestic infighting and finding it hard to preserve the power of its Syrian client, Bashar Assad. There is no real pressure on Netanyahu to rush into a preemptive strike on Iran, but there is also no one to stop him if he decides to send the air force to Natanz, Bushehr and Qom. Under these circumstances, it is no wonder that Netanyahu looks satisfied with himself and is ignoring the warnings of Defense Minister Ehud Barak and President Shimon Peres, his erstwhile enthusiastic supporters, who are now predicting a "diplomatic tsunami" and "a crash into the wall." Instead of listening to them, he is celebrating his "victory over Obama" with his friends on the extreme right and even extracting praise from Foreign Minister Avigdor Lieberman. The problem is that Netanyahu's positions are diverging from those of his coalition, which is veering madly right. His declarations in favor of a Palestinian state are not acceptable to his partners, who are calling for Israel to annex the West Bank. His statement at this week's cabinet meeting, as reported by Barak Ravid in Haaretz yesterday, about his wish to separate from the Palestinians and to preserve a solid Jewish majority within Israel's future borders are closer to Olmert's positions than to those of ministers Uzi Landau or Limor Livnat, who argued with him about the "demographic threat." If Netanyahu believes in dividing the land, as he has asserted to Congress, the Knesset and the cabinet, he must change his political partners. In order to prove Barak and Peres wrong, Netanyahu must set up a different coalition. TOMORROW11 BLOG - Israel and America – Has the Love Cooled? (via live Blog Carl-IsraelMatzav).Recently, there have been fissions in this relationship revolving around such issues as the peace process, the settlements and the policy regarding Iran. Are these passing disagreements or are we witness to a worrisome slump in the relationship? Elliott Abrams says that Obama does not have the view of Israel that Clinton and Bush had. No great love for Israel, but deeper question is relationship between the two societies where there has been remarkably little change. America has Christians and Europe has former Christians and that's the difference between them. That's who supports Israel. Jewish community keeps getting smaller. Fewer young Jews are Jewish in any meaningful sense. Democrats much less enthusiastic about Israel but that pre-dates Obama and Netanyahu. Not personal. The left around the world hates Israel. Ethan Bronner asked Abrams if he's offended by the term 1967 lines. Abrams said that it's only offensive if it's not Israel's policy and it's being imposed on it. That drew some applause. Martin Indyk says that tension has existed in US-Israel relationship since time immemorial. Indyk describes Obama's speech as James Baker done over - claims it's nothing new. He says that whether the two sides can find a way to get back to the table is going to be tested now. He refers to September as a train wreck. Israelis have never considered UN cause for concern so why are they panicking now? (Because no one is sure Obama will actually veto). Indyk claims that Obama doesn't want negotiations either because he doesn't believe anything will come of them. Obama afraid he will have to veto, putting him on the wrong side in the Middle East. Indyk thinks that US and Israel will find partnership to relaunch negotiations but not likely they will produce anything. Itamar Rabinovich thinks there is a personality conflict between Obama and Netanyahu, which he calls a train wreck. He says that change in the Middle East may not be worse for Israel but it is more difficult. Depends what Israel does with it. Rabinovich raises linkage issue and infamous Petraeus speech. Does Petraeus believe it or is it what the White House wanted him to say? Obama himself said linkage to Tom Brokaw during campaign and that is a negative in and of itself. Rabinovich talks about base of support for Israel. He doesn't like what he sees on US campuses - specifically mentions Jewish faculty and students. He says it's a function of where and when Obama went to school. Robert Wexler says love is still present in US-Israel relationship. He says it's a passionate love affair. He takes issue with Abrams claim that President Obama does not have in his heart the requisite love for Israel. Wexler says he doesn't know what love any President had for Israel, but can judge them on statement, deeds and actions. Wexler touts security relationship with US-Israel and says that can't happen despite the President of the US. Wexler says that Obama got Israel into OECD - called every country voting to make sure they would vote for Israel. He thinks that's a fair amount of love. Regarding last 3-4 weeks - Obama spent his time trying to convince Germany, France and UK not to support unilateral resolution of 'statehood.' As a result, French Foreign Minister wanted peace conference. Abu Mazen said yes, Netanyahu said give me a week, Israel asked US to throw cold water on idea and US did. Wexler says African-Americans over age 45 have warm feeling for Israel but younger African Americans don't because of different set of formative events. Same with Latino community. Says we have to work on that. Says young Americans (including Jews) aren't liberal - they're progressive. Gay rights, abortion, etc. are givens. There's a degree of liberal thought that's a given among American Jews that has not necessarily been reflected in Israeli society. Where was Obama's love during the Cairo speech? Where was sign of affection? Living in an era where the whole Middle East is changing (and not the way Peres envisioned 15-20 years ago), if there is a gap between Israel and US radical forces could sneak in and this will undermine Israeli public's willingness to make compromises necessary for peace. This seems to have eluded Barack Obama. He has to make sure that the love is seen Any gap is dangerous for the State of Israel. She draws lots of applause. Ethan Bronner to ask questions and then let audience ask questions. Bronner said Gazans were concerned that Netanyahu got so much applause. So why doesn't Israel feel the love (he asks Yaron)? Gazans said that US run by Netanyahu and not just leaders - average 'Palestinian' said that. Yaron responds by saying that Obama has to speak to Israeli public and come here. Gets lots of applause. I doubt Obama will take that chance before the elections. Bronner asks Wexler about Petraeus idea. Wexler says he's uncomfortable with notion that American blood being spilled because of Israel. Bronner says that was a misquote. Wexler says it's unwise. Bronner asks if it's untrue. Wexler says that you can't says that there is no effect. Wexler says that Yaron asks them to show us some love, while Prince Turki says that America is an unabashed Israel lover. How can Turki say what he said and Ruth said what she said and both feel as they do? Rabinovich picks up point and says Turki was angry at passage in Obama speech that criticized Bahrain. Rabinovich says take out love and introduce intimacy. Rabinovich says there's a way to say yes, US a close friend to Israel, let's see how we can make it to the Palestinians advantage. Rabinovich says that Israelis are nervous because they see how the US treated Egypt. He says that Netanyahu needs to lay out to Obama what he is willing to do, which is what Sharon and Rabin and others did. Obama has to have Israeli partner who levels with him. Rabinovich said that what happened in Congress is good. Arabs think time is on their side. The message of the Netanyahu speech and Congress' reaction is that time is not on the Arabs' side. Bronner asks if problem is policy gaps or if there is something at the core that is troubled. Abrams says that for some people it's both. He says to forget the Europeans but as far as the Democrats are concerned, if Israel only country criticized that has nothing to do with Netanyahu. In Europe there's a fundamental issue of anti-Semitism. But is Democrat problem existence of State of Israel? No, but it goes too far to say that the problem is just the policies. Abrams said that when Bibi said that we would only keep the blocs - which no Likud Prime Minister has ever said - Obama didn't give him any credit. That's where we're missing the love. Obama attitude is sooner we get rid of Bibi and Likud the better - you can do no right. Indyk addresses Abrams' point about Bibi Knesset speech about only keeping blocs. Says that Bibi's coalition makes it sound like his concessions aren't concessions. Bibi may have made important statements but they were cloaked in other language that made it sound like he wasn't making concessions at all. Bibi heads coalition that does not support two-state solution. That is not Obama's fault. Indyk agrees that Obama should have come to Israel and addressed Knesset and said we can't get explanation from anyone who works for him why he won't come. Obama has ignored Israeli public opinion and Israelis can't stand it. Especially since he's chasing the other woman (Palestinians). The only relationship Obama seems to have that's intimate and close is Russian President. He's not warm and cuddly. No drama. He says Israelis should get over it and that Yaron is describing a neurotic nation (lots of laughs). Israel is already 60 years old and it's time to grow up. Get over whether he loves me or he loves me not. Israel has to find solution to problem with 'Palestinians.' Not acceptable to continue 'occupation.' When Israel solves this problem, it will have the love of President Obama. Abrams agrees that Obama doesn't have this relationship with anyone else but that doesn't matter because no one is trying to kill or eliminate anyone else. The reason Obama has not come to Israel is that he does not want to come to Israel. Ruth Yaron says that there is a solid majority of 70% in Israel that supports two-state solution but tapping that majority is difficult because of political system. Says Israeli public is not shifting to the right and that Obama could tap into reservoir by speaking to the public. Wexler agrees with Indyk, Says Obama agreed to Israeli military presence in Jordan Valley and don't have to leave until demonstrated that 'Palestinians' are doing what they are supposed to be doing. Where's the applause from the Knesset? Audience question: No one has addressed the questions of Obama putting us in corner by settlement freeze and 1967 line surprises. Does anyone disagree that the President cornered Israel and therefore people believe he doesn't love them. Rabinovich says that settlement focus was a mistake and that Netanyahu should have made Bar Ilan speech earlier. TOMORROW11 BLOG - Tony Blair calling Israel "a model for the Region"
Quartet envoy Tony Blair told the audience at the Israeli Presidential Conference in Jerusalem that "supporting freedom is an intervention that goes with the grain of human progress". He said that while dictatorships promoted instability and conflict, history had proved that democracies rarely made war with each other. He said the instability in the Middle East was for the greater good of Israel. "The former British PM also defended Western support for Israel in rather unique terms. Neocons in the US often express the hope that Iraq can serve as a model to the rest of the Arab nations, but Blair said that Israel is “a model for the region.” “Come and see what Israel has done in 60 years,” Blair said to thunderous applause, pointing out that it’s Israel’s freedom that allowed for its advances. “Freedom is not a passing phase,” Blair emphasized, “it is the condition that defines the human spirit.” And for that, Blair got the standing ovation at the end that he also received at the beginning". (Carl-IsraelMatzav.blogspot). Attending the President's conference here in Jerusalem - a session entitled Thin Ice – Criticism vs. Loyalty in Israel-Diaspora Relations. Ben Ami (J-Street)is the first speaker and immediately goes to how we talk about Israeli-'Palestinian' relations. Ben Ami rejects the notion that we are not loyal to those that they criticize, saying that loyal friends give criticism and advice (yes, but not in public). He rejects the notion that criticizing the government does not demonstrate disloyalty. He says it's a mistake for the government not to meet with organizations that disagree with it. He criticizes the hearings held in the Knesset on J Street. Ben Ami cites Peres warnings about no peace process and calls him 'captain of our ship' (but no one elected Peres). He claims that his opponents are trying to distract attention from a conversation about the path that Israel is on through discussions about loyalty. Danny Dayan (one of Settlers leaders) discusses boundaries of Jewish solidarity tent. 50-60 years ago you had the anti-Zionist bundt which was anti-Zionist but part of the Jewish solidarity tent. Today that's inconceivable. Today the boundaries are set by the litmus test of at least not being anti-Zionist and anti-Israel. Neturei Karta and BDS are both outside the solidarity tent. Oz-Sulzberger ( Israeli writer and historian) says we have to be careful not to be hijacked by enemies of Israel. Please respect our differences of opinion and don't push us out. People who voice moderate, left-of-center Zionist opinions - Meretz to Kadima spectrum - are shunned by their Jewish congregation members. (Third sentence got much less applause than first). There should be no problem in lovingly critiquing our government. She applauds Facebook Judaism. She thinks this is good for the Jewish future. Diana Pinto (intellectual historian and writer living in Paris) believes that we ought to be able to say what we think about Israel. She says there is more than one diaspora. There are Israelis who live abroad because they feel that their values are not being recognized in Israel. And then there are other Israelis abroad who are more loyal to Israel without carrying an Israeli passport and are making sure that moderate leftwing positions are frightening. (Dayan is looking more and more like a token on this panel, isn't he?). Eric Yoffie (president of the Union for Reform Judaism URJ) says that there are multiple Jewish diasporas. We are the most variegated people on earth. Supporting governments unconditionally is a mistake. Even Jewish governments are imperfect human creations. Only an anti-Semite can believe that Israel has always had the leadership it deserves. Neither right nor left believes it must unconditionally support Israeli governments - right didn't support some governments and left didn't support others. The story of the diaspora is the story of passionate particularism. We have to accept and support diversity. But there have to be red lines. If it means everything, it means nothing. Diaspora communities entitled to say that there are some views that are outside the tent and government of Israel is entitled to set its own standards. He includes BDS and questioning every act of self-defense by Israel as being outside the camp. He says that supporting policies that prevent Israel from ever being Jewish and democratic also puts you outside the camp. Then he adds state of Israel action that delegitimizes reform and conservative Judaism. Shmuel Rosner now asking short questions. He asks Ben Ami whether there is a difference between giving advice and lobbying foreign governments. Can you apply political pressure to Israel? Ben Ami says the question is relative and loaded and says he wants to answer a different question. He says that Jewish Americans have the right to express their opinion regarding American foreign policy. Obviously question directed at J Street and he says that J Street doesn't lobby US about pressuring Israel - he says that they lobby for a two-state solution. He ducked the question. Asks Danny Dayan the same question. Dayan reads J Street attempt to lobby US government not to veto the Security Council resolution in February. Dayan addresses Yoffie's words and says that the reform movement was anti-Zionist and came in to the Zionist tent, but Ben Ami, on the other hand, knows that Dayan refuses to boycott J Street, but says he is having second thoughts over whether he should have met with J Street congressional delegation two weeks ago. He quotes Betty McCollum who justified rockets from Gaza and was endorsed by J Street, which undermines Israel's interests. He gets lots of applause for that. Ben Ami responds that what's undermining the state of Israel is the settlement enterprise. Gets much less applause. He sees settlement enterprise as a threat. Dayan asks when J Street last did something that was just pro-Israel. Ben Ami says that they do it every time. Ben Ami claims that they lobbied for the Iran sanctions (that's a lie). Dayan reads J Street statement from Ben Ami and Trita Parsi, and Ben Ami claims it's being read out of context. Pinto says that we are too quick to reject criticism as anti-Semitism when it comes from non-Jews. She says that we have to play for the middle terrain. Eric Joffie says we need to reach young people on campuses and we are not reaching them with arguments about black or white, in or out. He says that our young people want to hear us make the case for Israel in a loving, compelling way. He opens the floor for questions. Asks that we keep questions short. First question asks whether J Street lobbied against condemning Palestinian school books. Ben Ami says no. President of Australian Zionist federation asks about BDS limited to 'West Bank.' Does J Street distinguish that from other BDS. Says he sees no distinction and says that J Street is opposed to 'West Bank only' BDS (that's a surprise). Rosner asks Dayan how he would engage young Jews in diaspora communities with Israeli policies Dayan says that we have to fight ignorance and that he agrees with every word of Rabbi Yoffie. Dayan says that he is all in favor of opening reform communities in settlements - just come. But like Rabbi Yoffie said, you can't cross the red lines. South African Zionist Federation delegate raises Goldstone. Asks Ben Ami why J Street went all out to introduce Goldstone to US Congress. Adds quick anecdote. They asked Goldstone whether he believed the Israeli government was responsible for war crimes and Goldstone said no. Ben Ami responds that the Washington Times is an ideological newspaper and that they didn't try to introduce Goldstone to Congress. Last question: Nationalism is out of favor with young people and Zionism is Jewish political nationalism so settlement policies not what's turning off youth. Pinto responds that human rights and other international references aren't wrong and can't assume they're just a code word for Israel bashing and new anti-Semitism. Says we had better revise our notions. Can't throw principles away with misused realities behind them or we paint ourselves into ethnic corner. "The most crucial decision we can make for a better tomorrow is how we educate our children," she said, speaking alongside her host, President Shimon Peres. "How wonderful it would be if the world would act like a team. We have so many challenges ahead of us, so many problems to solve, This is the time to behave like a team, to wear the same T-shirts and to win the match of discrimination, to win the match of inequality and segregation." In an interview with The Associated Press, Shakira said she had great respect and love for the people of Israel. Prime Minister Benjamin Netanyahu sent a personal letter to Turkish Prime Minister Recep Tayyip Erdogan congratulating him on his victory in the Turkish elections last week, and expressing his wish to heal the diplomatic rift between Turkey and Israel. In the letter, Netanyhu said he wanted to normalize relations with Turkey, and emphasized the good relations the two countries have had in the past. "My government will be happy to work with the new Turkish government on finding a resolution to all outstanding issues between our countries, in the hope of re-establishing our cooperation and renewing the spirit of friendship which has characterized the relations between our peoples for many generations". (Barak David-Haaretz).Prime Minister Benjamin Netanyahu surprised many of the participants in the weekly cabinet meeting Sunday when he embarked on a monologue praising the idea of parting from the Palestinians and in relinquishing portions of the West Bank. Netanyahu said the number of Palestinians and Jews between the Jordan River and the sea "is irrelevant" and that it's more important to "preserve a solid Jewish majority inside the State of Israel." The PM made these statements during a discussion on a report by the Jewish People Policy Institute on demographic changes among Jews and Palestinians in Israel and the West Bank. Members of the institute presented the demographic data of Prof. Sergio DellaPergola, which show that, in a number of years, the demographic trends will result in a Palestinian majority between the Jordan River and the Mediterranean Sea. Ministers Limor Livnat and Uzi Landau were surprised by the data and asked that the data of other experts be presented - for example, the data of Yoram Ettinger, who is affiliated with the right. The right argue that the demographic threat to the State of Israel is not so serious. The prime minister cut short the discussion and surprised those present with previously unspoken sentiments about the future Israeli presence in the West Bank. "The debate over how many Jews and how many Palestinians will be between the Jordan and the sea is irrelevant,It does not matter to me whether there are half a million more Palestinians or less because I have no wish to annex them into Israel. I want to separate from them so that they will not be Israeli citizens. I am interested that there be a solid Jewish majority inside the State of Israel. Inside its borders, as these will be defined". Obama: Despite tactical disagreements, Israel is U.S. closest ally and friend. US President Barack Obama reassured Jewish donors on Monday he strongly supports Israel, stressing close ties between the United States and the Jewish state, but also emphasizing that changes in the Middle East will require a fresh look at the region. "Both the United States and Israel are going to have to look at this new landscape with fresh eyes,It's not going to be sufficient for us just to keep on doing the same things we've been doing and expect somehow that things are going to work themselves out. We're going to have to be creative and we're going to have to be engaged." Obama said Israel is the United States' "closest ally" and that he was committed to Israel facing the challenges "from a position of strength," noting the closeness between the two countries' defense establishments and his increase in defense assistance to Israel. "The most important message I have for all of you here tonight is that, even as we try to manage what is going to be a very difficult and challenging situation over the next 12 months, the next 24 months, the next decade, that one inviolable principle will be that the United States and Israel will always be stalwart allies and friends." "But the broader vision, is one in which Israel is a secure Jewish state, One where it is able to live in peace with its neighbors, where kids can get on the bus or go to bed at night and not have to worry about missiles landing on them, where commerce and interactions between peoples in the region is occurring in a normal fashion, where the hopes and dreams of the original travelers to Israel, the original settlers in Israel, that those hopes and dreams that date back a millennium, that those hopes are realized. That will remain our North Star. That will remain our goal." "It going to require that not only this administration employs all of its creative powers to try to bring about peace in the region, but it’s also going to require all of you as engaged citizens of the United States who are friends of Israel making sure that you are giving us suggestions, you are in an honest dialogue with us, that you’re helping to shape how both Americans and Israelis think about the opportunities and challenges." "That bond isn't breakable and ... Israel's security will always be at the top tier of considerations in terms of how America manages its foreign policy... Israel is our closest ally and friend. It is a robust democracy. It shares our values and it shares our principles." "My hope," he concluded, "Is that through the kind of conversations that we’re having here tonight, that we’re going to be able to, together, craft the kind of strategy that not only leads to a strong America, but also leads to a strong Israel." Obama, who has clashed with Prime Minister Benjamin Netanyahu's government over settlement building and parameters for peace talks with the Palestinians, said that in the coming months "there may be tactical disagreements in terms of how we approach these difficult problems." Organizers of the event, entitled "Obama Victory Fund 2012 Dinner with the President in support of a strong US-Israel relationship" ushered the White House pool reporters out of the room at the Mandarin Oriental Hotel after Obama's short talk so he could talk frankly with the donors. Witnessing his dream of a Diplomatic Tsunami and International pressure on Israel following a Dramatic UN declaration of State, being put to rest, with the growing opposition of leading European Countries, headed by the US-Obama administration, Abbas is once again running away from a decision, waiting for the US to do the Job they did so lousy over the past 2 years, pressuring Israel to give in to pre condition demands in exchange for renewing the peace process. (Ynet).Palestinian President Mahmoud Abbas said Monday he would forgo a September declaration of state at the UN if the United States could provide a better suggestion. "I don't know if the US has another option, but if it does, we will not go to the UN," Abbas told Lebanese television station LBC. "Going to the UN is not a unilateral move, as Israel claims, President Obama says he wants to see an independent Palestinian state by September. The Quartet has said the same. Fayyad's government has guaranteed its authorities will be prepared for a state, and they are one-hundred percent ready. These three reasons caused us to speak of September. That, in addition to the absence of negotiations". He added that the two "problematic" issues stalemating negotiations were "borders and security". The rest, he says, can be solved. "We have so far not discussed the core issues with Netanyahu. I only spoke with Netanyahu for altogether 15 hours and met with him three times over two years. We spoke only of security issues. Netanyahu spoke of Israeli presence along the Jordan River because he fears for Israel's safety in the shadow of the Iranian threat". When asked whether he believes a third intifada will break out after the UN General Assembly in September, if the Palestinian move fails, he replied, "The armed resistance is killing us." New York Times columnist Thomas Friedman floated in a column Sunday to re-visit the 1947 General Assembly partition resolution, this time in the Security Council. In such a resolution, Friedman argued, the Palestinians “would gain recognition of statehood and UN membership, within provisional boundaries, with Israel and America voting in favor. And the Israelis would get formal UN recognition as a Jewish state – with the Palestinians and Arabs voting in favor. Public opinion polls in Israel and in the US show that a majority of Israelis and Americans alike agree that this conflict is not a territorial conflict but a religious ideological conflict, the refusal to recognize the existence of Israel as a Jewish state. So Thank you Mr. Friedman for the hard work squeezing out the lemon for us, but without providing a Glass, the lemonade will get spilled, without any use. No September, No Freeze, Now back to talks?